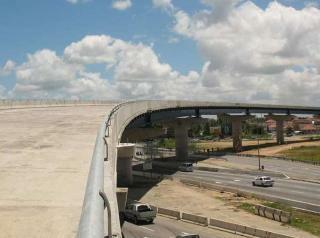 The Churchill Roosevelt/Uriah Butler Highway Interchange is one of the NIDCO's (National Infrastructure Development Company Limited) mass transit solutions to the ever increasing traffic congestion problem in Trinidad. The contractor, VINCI Construction France, used innovative construction technology to assemble the individual steel frames without disturbing the normal traffic flow below. Each frame of 2500 tons and 600 metres long, were "pushed" into place by hydraulic jacks anchored to concrete beams. The interchange is currently the country's highest bridge structure towering some 18 metres high. In the final stages of the development, the project was rushed to completion for the "Summit of the Americas" conference and President Barack Obama's visit in April 2009. Radcon #7's ease of application alone proved to be quite beneficial for this particular project, not to mention the cost savings with no protective slab or asphalt topping requirement. Furthermore, no future maintenance costs are guaranteed by Radcon #7's unique ability to reseal future hairline cracks up to 0.3 mm. Radcon #7 technology has proven over the years, to be a superior structural concrete waterproofing solution for its versatile and reliable characteristics.